Lock in a great price for Ayre Hotel Rosellón – rated 8.8 by recent guests! The location is very close to the Sagrada Familia and the metro station. The rooftop view of the Sagrada Familia was stunning at sunset. The room was very comfortable and the bathroom was HUGE! I really loved the walk-in shower, which had plenty of space and the rain shower head had really good water pressure. It was close to La Sagrada Familia church. The staff has respectful and very helpful. The bar is small and intimate and serves tasty tapas. Very good location ! 3’ walk yo Sagrada Familia & metro . Christina at the front desk gave extraordinary service and care. I had difficulty logging on to the airline web site. Christina helped to print my boarding passes alleviating a lot of stress for my husband and I on the last day of our vacation. Also, I asked for a queen bed and was accommodated as the twin beds in my room were transformed. the staff is amazing, they go way beyond to help you. 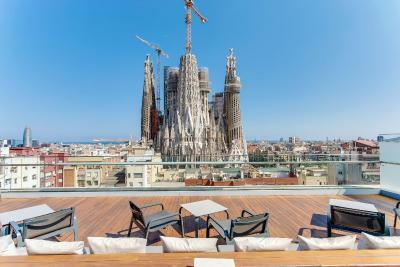 This is a great hotel, placed literally 1 street behind the Sagrada Familia, with a magnificent view from its rooftop terrace towards the famous basilica. 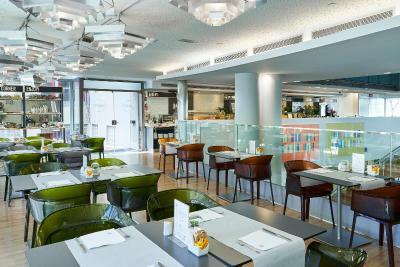 Overall modern feeling, with a great 8 floor high atrium over the lobby and relaxing area on ground floor. Rooms are modern, clean and perfectly double isolated from street noise (best i've met so far). Polite, smiling and helpful staff. 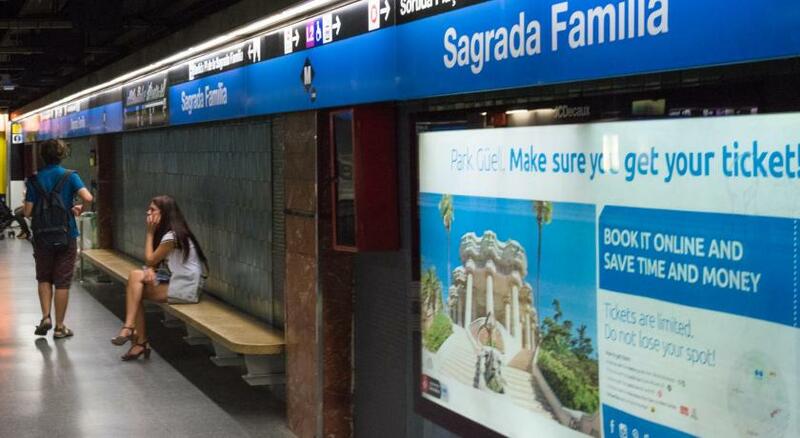 Access to metro lines 2 and 5, the Sagrada Familia station is basically 1 min away. Absolutely recommended! Location, view from room and terrace. Exceptional staff. Highly recommend it!!! The view of the La Sagrada Familia was amazing. Really stunning and worth the extra expense for the wow facfor. The staff was awesome. They provided a wheelchair so that my wife and I could enjoy visiting Sagrada Familia. The reason I needed a wheelchair is because I had fallen on steps on our trip to Monserrat the previous day. Ayre Hotel Rosellón This rating is a reflection of how the property compares to the industry standard when it comes to price, facilities and services available. It's based on a self-evaluation by the property. Use this rating to help choose your stay! 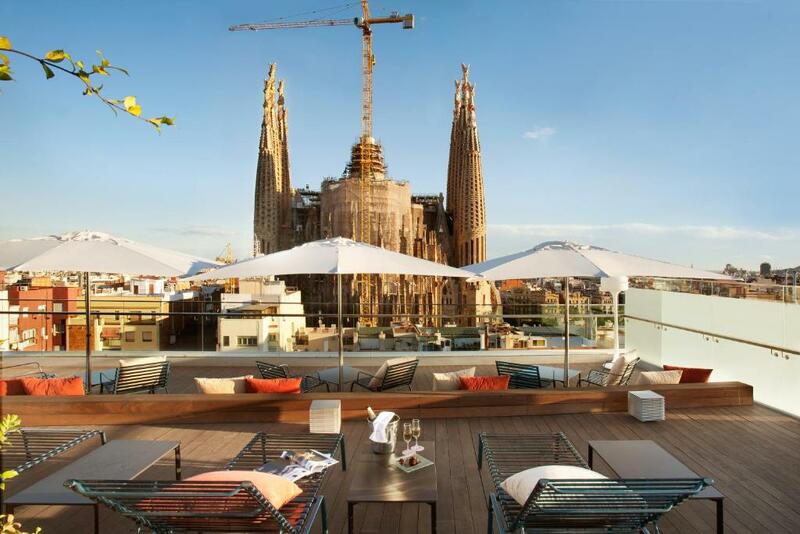 One of our top picks in Barcelona.Just 650 feet from Barcelona’s famous Sagrada Familia, this designer hotel offers a rooftop terrace with panoramic views of Gaudís famous basilica. Rooms at the Ayre Hotel Rosellón include flat-screen TV and free Wi-Fi. All air-conditioned rooms at Ayre Hotel Rosellón feature stylish, modern design. A free bottle of water is provided in the minibar upon arrival. The Ayre Hotel Rosellón has an elegant restaurant and a cafe. A varied buffet breakfast is available each morning. The hotel is a 3 minute walk from Sagrada Familia Metro Station, which offers direct access to central Barcelona. City tour buses stop 800 feet from the hotel. When would you like to stay at Ayre Hotel Rosellón? This air conditioned room features free Wi-Fi and a plasma TV. There is a hairdryer in the bathroom, and free water is available in the minibar (until first refill). This air conditioned room has views of the Sagrada Familia. It features free Wi-Fi and a plasma TV. There is a hairdryer in the bathroom, and free water is available in the minibar (until first refill). House Rules Ayre Hotel Rosellón takes special requests – add in the next step! Ayre Hotel Rosellón accepts these cards and reserves the right to temporarily hold an amount prior to arrival. The property reserves the right to pre-authorize the credit card used to make the reservation for the total amount of the reservation as a guarantee. Please note that room preferences are on request and subject to availability. I was expecting much more atmosphere. It is a plain hotel and although our room had a view of Sagrada Familia, it was not inspiring . It is a modern hotel, and very adequate but soulless. Staff friendly and obliging. Not in popular area so spent quite a lot of euro on taxi to get out and about. 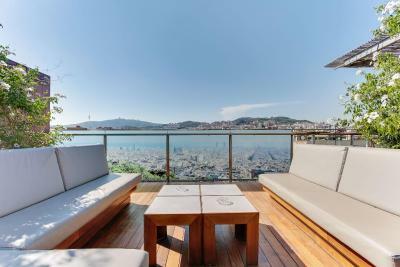 The location and terrace were great! Close too, and stunning views of the Sagrada Familia! The rooms were clean and tidy, bed comfortable. We ran into some trouble when we discovered that the rooftop terrace doesn't open until around 10am. We wanted to take sunrise photos on the terrace but the doors were locked. We asked the front desk and they said it was closed for cleaning. However, one of the guest relations staff opened the terrace and allowed me to take photos there at sunrise. My room faced an inner courtyard and there was no ventilation on a lovely spring evening when I would have liked to open the window. Was abit misleading with the bars on the window assumed it was a balcony but apart from that it was superb. Also could of done with a clean underneath the beds everything else was fine. Welcoming friendly staff very helpful.. close to restaurants and shops and metro for easy access to the city.. The roof terrace made the stay alot better for chilling out when back at the hotel. The views and weather is nothing to none would definitely stay here again. Facilities are poor here. No gym. No pools at all. Location is the key! Rooftop here is the best! Location alittle further than I usually like but you are 2 minutes away from the Sagrada Família And lots of nice places to eat around so it’s actually fine if you like to wander and explore Just in the evening if you want to go closer to el born/beach etc. The hotel is lovely, it has security at peak times of the day. The reception is 24hours and the staff are smiley and are happy to help with anything you wish (iron and Iron board/borrow an adapter etc.) The hotel is alittle further out than I expected. I have been to Barcelona a few times and have always stayed more towards the centre but cabs are easy to grab outside the hotel door and on a sunny day it’s a 40 min walk in. The rooftop is STUNNING! Quite breathtaking actually Not too crowded but we stayed in April- not sure how it would be summer As we chatted with lots of people who came just to the hotel for the rooftop! The breakfast is one of the best breakfasts I have had in a hotel also - everything you expect and more. Hot food such as bacon/different egg each day/tomatoes and beans Variety of warm breads Healthy choices - chia pudding/nuts/fresh fruit Cold meats a cheeses And then to add to it you can order from the menu of hot food I had avocado on toast with poached egg each day and it was gorgeous! I can’t really fault our stay! Good location, very nice view from terrace. The view from my room! Incredible! The breakfast was brilliant and varied as well. The room was excellent, as we're the rooms for my family. The roof top bar is superb and is a great place to chill out. The staff are very good and attentive. The bed was one of the best hotel beds I've slept in. No tea bags or milk replenished after first night. Had to ask and bar staff grumpy on providing. The roof top view with bar was amazing.